Gurmeet Sawaich is an undergraduate student who started volunteering with the Elizabeth Fry Society of Calgary in April 2018. She started in the Calgary Traffic & Bylaw Court and later moved on to the Traffic & Bylaw and Adult Criminal Courts in Cochrane and Airdrie. 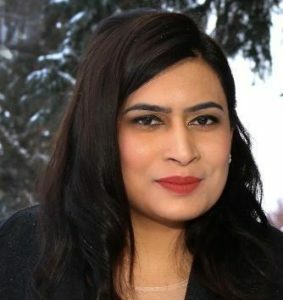 Interested in the legal system due to her academic background, and specifically women in need of resources and support because of her personal experiences as a woman of visible minority, Gurmeet felt that working with the Elizabeth Fry Society of Calgary was the best of both worlds. Volunteering, as well as making art, henna designs and travelling in her spare time, Gurmeet is currently working towards her degree in Law and Society, which she hopes to turn into a career. What has working with the Elizabeth Fry Society of Calgary taught you, both in your personal and professional life? Volunteering has honed Gurmeet’s skills that are not only vital in the kind of career that she hopes to pursue, but also in life, such as being a good listener, being respectful to everyone despite arbitrary categorizations and being non-judgemental in providing support. Gurmeet has also gained some very practical knowledge. She has become more interested in learning about legal resources, non-profit organizations that help individuals in need, the intake program and other resources available through the Elizabeth Fry Society. She has also gained an understanding of the underlying issues that lead individuals into the legal system and keep them there. Why should the community support the Elizabeth Fry Society? How has your role with the Elizabeth Fry Society changed you as a person? How do you think it has changed or impacted those who have come to its doors seeking support? This is a change evident not only to Gurmeet, but also those around her, who have commented that she “looks more confident and fulfilled.” She has also learned that “helping others is always a gain” and that she certainly is “making a difference by helping the community”, and helping those in the legal system who have no idea of their next step by directing them towards their next steps in their journey within the legal system. Gurmeet relates a story of a woman who appeared for a court appearance, with a bag containing all her belongings, as a conflict with her husband had left her on the streets and barred her from seeing her children. Eager to help, a staff member of the organization, advised her to visit the office, where she would receive assistance in finding a place to stay, food, and any legal resources she might require. She was visibly relieved as she left, knowing that she “was not alone in her fight. She knew that the Elizabeth Fry Society was there to help her”, which at the core of it, is what the society is all about: helping everyone and anyone who needs it!